Believe it or not, the iPhone has become a stealth hit over on this Soggy and Septic Isle. But this should come as no surprise to anyone familiar with the psychology of the British punter. When the iPhone arrived it here it was greeted with studied indifference. You’ll recall that Carphone Warehouse and O2 stores stayed open late for a stampede that never came. The splashy launch – and the glee at O2’s discomfort that followed – only seemed to confirm the view that British punters congratulate themselves for being immune to imported hypes. But this has been overtaken by another aspect of consumer psychology here. More than anything else, British punters love boasting about a bargain. Like tea, it’s something that unites all classes. Even if one must lie about the “bargain” that isn’t a bargain at all – and has just been bought on an already over-extended credit card. So we shouldn’t be surprised that shortly after Apple’s UK retail partners slashed the price of the 8GB by £100, it had sold out. This also confirmed that the iPhone has been more successful as a word-of-mouth hit than it was as sensation-of-the-month. I’ve noticed that the people sniffiest about the product are people who have yet to see a friend using one. The huge and incessant advertising campaign from O2 and Apple may actually have obscured, rather than illuminated, two facts: it’s a pretty decent product, and that people like to use it. Satisfaction ratings for the iPhone after months of use are far higher than for any other phone – which suggests it’s passed the real world test. For sure, it isn’t perfect – but most of what it does, it does superbly. And yes, it really has got grown men stroking a piece of glass in public. So we can surmise that so far, this is a piece of kit that has been held back by the exclusive distribution model (the exclusive carrier deals) that Apple has preferred. Fortunately, we’re already seeing this crack, with non-exclusive deals signed in Italy, India and Australia. This means that means rival operators in each market will be prepared to lower the upfront cost of acquiring an iPhone: remember that when you get a phone, you’re essentially getting it on a hire-purchase agreement at a subsidized price, paying for it over the period of the contract. Which means an iPhone will no longer be prohibitively expensive. Let’s contrast this with Nokia’s fortunes. Can Nokia still cut it? Then there’s another factor: Smartphone Apathy. I first drew attention to this almost two years ago – when it was evident that Nokia’s vision of convergence was in a lot of trouble. As I wrote in Whatever happened to … the smartphone?. The smartphone had found a niche with enthusiasts, but most of the potential of an open, flexible device with lots of third party software was ignored by most of the people who had one. Nokia has the volumes in the smartphone market, but it hardly matters. Pundit Dean Bubley recently drew attention to just how indifferent the public is to this prospect. All of which must make long-time Symbian veterans wince – it’s not their fault, after all, that their dominant customer keeps churning out products that fail to excite the market. My particular favourite example of how the iPhone succeeds where Nokia’s S60 fails is their respective Maps applications. With the iPhone, you start typing a name and it will assume that it’s the name of a contact with an address that you’re after. With a minimum of keystrokes, you’re away. It’s so obvious. Yet despite a €7.7bn acquisition of the world’s leading map provider, Nokia still doesn’t provide this deep level of integration, and in keeping with the Spirit of S60, simple things are hard to do. There’s another reason Nokia is weak where it should be strong. What are they smoking in the Strategy Boutique? In a recent blog post titled Nokia goes for 1% market share in the US, analyst Michael Mace gave a damning overview of Nokia’s marketing. As we’ve noted before, this is designed to win over gadget bloggers in focus groups, but looks shockingly bad to your ordinary civilian. One great example of this is the “Jealous Computers” site for Nokia’s Nseries phones. 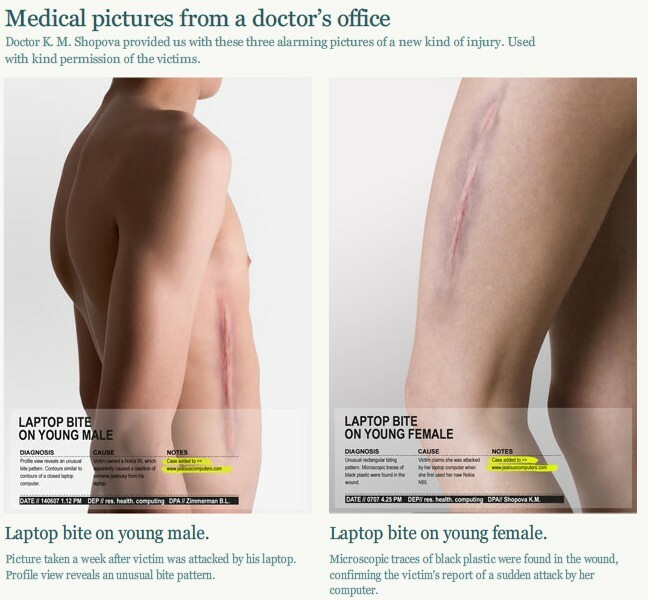 This purports to show victims of “attacks” by jealous laptops. Trebles all round at the ad agency. We’d never thought of “Total Cost of Ownership” quite like this before. While this may go down a storm with the Emo kids, it’s not the way to sell a mass market consumer device. But because it’s dependent on closed feedback loops, or what is fashionably called an “information cascade”, Nokia seems unable to accept this. So Apple has simply stepped into a market which was ailing through customer indifference, and rejuvenated it. How will the rivals fare with the imminent launch of the 3G iPhone? Ominously for the established players, Apple is loosening the carrier restrictions which have held back adoption. Reports suggest it may also lower the price of the older model, to further stimulate the market. All of which means the iPhone is a bigger threat than rivals have realized. When the iPhone is priced similarly to the competition, the quality simply blows them away. Sony Ericsson, whose investment in UIQ has given it a far richer and friendlier interface than Nokia’s cumbersome S60, looks well placed to capitalise on the renewed interest. It’s given a little bit of “touch” to its new phones, but focussed on how the touch UI can help do a couple of things very well. (Page down to the promo videos, here, and you’ll see what I mean.) But SE has only two UIQ phones announced, so far. While it’s reasonable to argue that “smart devices” may never become a truly mass market, and will remain niche, Apple has earned its leadership through sheer quality – making rivals looks stupid. And along the way its strongest potential competitor, Nokia, has turned into a Sony – but not how I imagined. Sony was always a hothouse of viciously warring factions, far keener to kneecap each other than sock it to the competition. Just when the market needs a strong and coherent response, a similar fate has befallen Nokia.